Stil: perfekte Ergänzung für Ihre Schlüssel oder Strandtasche! •Style: perfect complement for your keys or beach bag! Trendy with these elegant gold-plated ear rings with freshwater pearls. Pleasant to wear through narrow hook closure. 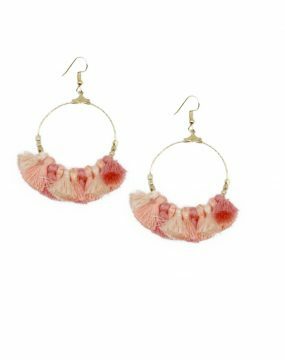 Large, elaborately made tassels Earrings made of colorful cotton ropes and playful colorful tassels. Ibiza beach bag full of sequins, an awesome aztec print and leather handles. •Size: short part 65cm . Long part 89 cm. •Colour: white, different shades of blue and pink. Neon. •Details: 2 different parts. The short part has a gold chain with a tassel hanging in blue color.The long part of the necklace has a blue string and small pearls multicolored. Hanging a bigger tassel in a neon pink color. •Style: you can wear this fun necklace with all colours. Our favourite look is wearing it with a blue and white outfit. Scarf with pink crowfoot pattern This white scarf with pink buttercup pattern is finally available again. Cuddly soft to wear on your skin. The scarf is an indispensable piece of clothing from the brandnew Rose & Vie Paris Town Fall / Winter 2017 collection!